Part 1: The Speaker plans to build 40,000 new middle-income affordable apartments over the next ten years. In order to accomplish this goal, Quinn called for increased financial commitment from the City. She believes the government needs to continue to be more efficient and save money by streamlining its back office operations. She cited the City’s technology upgrades and management of its own vehicle fleet as ways the government has saved millions of dollars per year. The Speaker also believes the capital budget needs to be used more efficiently; for example, the City should use idle funds from agencies to build housing. Finally, Quinn believes it’s time for the City to borrow additional funds to invest in the middle class now while interest and mortgage rates are at an all-time low. Part 2: The Speaker announced that she is working with New York State Senator Martin J. Golden and Assembly Member Keith L.T. Wright to introduce the Permanent Affordability Act in the State Legislature. This Act will give building owners a new tax exemption by capping property taxes at a certain percentage of their rental income. In return, they will be required to keep their units affordable. This program builds on the Mitchell-Lama Housing Program which helped create over 100,000 middle-income rental apartments. However, the affordability requirements in that program were built to sunset after 20 years. So far 30,000 affordable units have been converted to market rent. The Permanent Affordability Act would help preserve affordable units that are in danger of being lost. Part 3: Quinn plans to use a new innovative tool that will turn existing market-rate housing into affordable units. The Speaker is working with New York State Assembly Speaker Sheldon Silver and Senator Golden to introduce legislation to create a pilot program targeting certain neighborhoods. In exchange for converting a number of units to affordable middle-income housing, building owners in these neighborhoods will receive property tax caps at a fixed percentage of the building’s rental income. This will help make areas such as Park Slope, Carroll Gardens, and Astoria affordable for the middle class. Part 4: Quinn believes the City needs to take steps to ensure that the City’s housing is good enough for people to want to live and raise their families there. The Speaker plans to work with the Council to undertake a top-to-bottom overhaul of the City’s Housing Maintenance Code. For example, the overhaul would seek to prevent bad landlords from relying on quick fix remedies for general housing code violations by implementing new penalties for landlords who have repeated violations. The remainder of Quinn’s speech focused on tax crediting child care costs, creating more middle-class jobs, helping small businesses, expanding health care industry jobs, and reinventing the workforce development system. 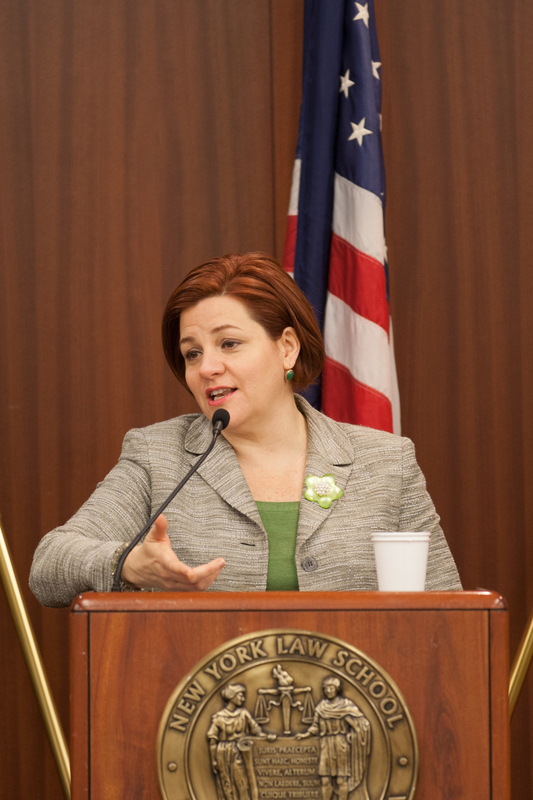 Read coverage of Speaker Quinn’s address at the Center for New York City Law’s Breakfast Series. Mayor Michael R. Bloomberg gave his State of the City address today at Brooklyn’s Barclays Center. Check back with CityLand for in-depth coverage of the Mayor’s speech.